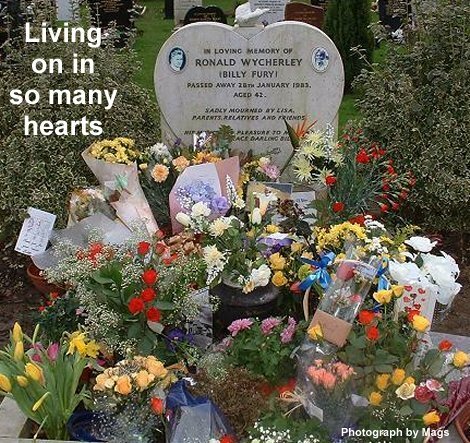 After the traditional meeting at Billy's grave on 26 January, 2003, a service was held at Mill Hill East Church. Unfortunately, Albie and Jean Wycherley were unable to attend, as they were both unwell. I counted 112 people at the service. This was a much higher number than usual for one of the regular gatherings, reflecting the significance of the occasion. After the opening prayer by the church leader, the Rev Ray Ashley, we sang Morning Has Broken. The lesson was from John 21, with the theme of "Blessed are they that have not seen, and yet have believed." 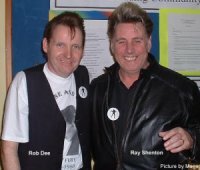 Bob Paskins, who backed Billy as a member of the New Tornadoes in the 1970s, then recalled their year on tour. Accompanying himself on acoustic guitar, he sang I'd Never Find Another You, with many of the congregation supporting him. Mr Ashley gave a short address, mentioning Billy's many qualities and his capacity to bring pleasure through his music. Ray Shenton and Rob Dee provided an unscheduled addition to the service, singing Moya's reworking of an old favourite, which had become The Chapel At Mill Hill. Led once more by Bob, we all sang In Thoughts Of You, before the service closed with a prayer and a blessing. In the adjacent hall, we snacked on goodies brought by the congregation, and chatted and chatted...and chatted. I sold copies of Without You and Albie's EP, while Chris and Linda Eley ran a stall offering assorted merchandise. I had to leave at 3.45, before an auction was held - if anyone can fill in that blank or any other, or feels I've dealt inadequately with anything, please let me know. Among the many people there were a good number who meet on this site. I was sorry to have so little time to get to know you all better - but there'll be another day. I hope soon to add a media file of the service. Special thanks to Ray and Jean Shenton for a contribution to this piece of which only they and I are aware. I hope!